From herbs to citrus to ginger; you can grown your own, even during the cold months ahead. Gardening is often treated as a seasonal sport, but it’s possible to play in winter, too – you just have to learn a slightly different set of rules. The first, and most important, step is to understand which crops are best adapted to indoor growing. Then it’s a matter of creating the right conditions for each. If you have a sunny south-facing window, some of the crops below are fairly effortless to grow indoors in winter. If you have them growing in a pot outdoors already, simply reposition them inside and continue providing water and fertilizer (here’s a selection of natural and organic fertilizers suitable for indoor plants). Others will need supplemental lighting in order to thrive, as winter days are too short for many species to photosynthesize sufficiently. Find indoor grow lights and accessories online and at garden centers and hydroponic stores. Full spectrum fluorescent bulbs are the most widely available and cost-effective type. 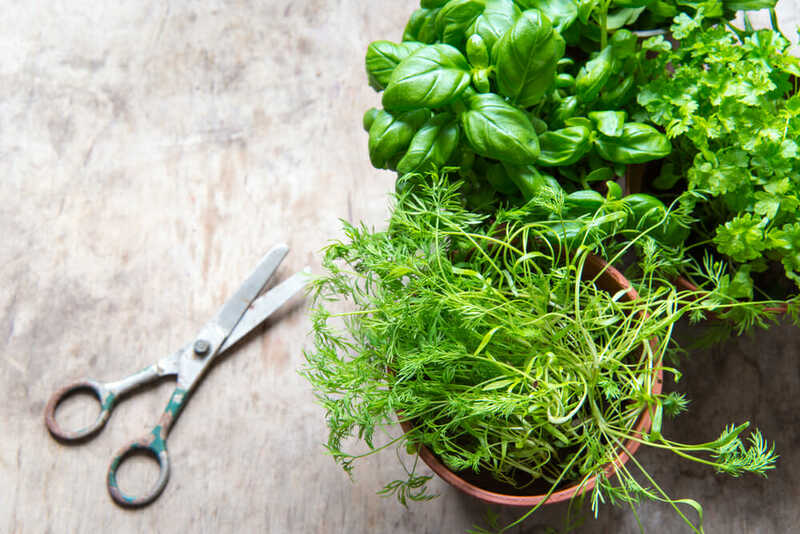 Basil, oregano, sage, lavender, mint, thyme, rosemary, dill, and other herbs are among the easiest edibles to grow indoors. Of these, mint is the most shade tolerant, though it still needs a few hours of direct light each day to thrive. Basil and dill have the highest heat requirements, so you’ll want to make sure they’re located in a room that stays above 60 degrees at night. Lettuces, arugula, spinach, kale, and other leafy greens are also easy to grow indoors, though you’ll have more luck harvesting them as baby greens, rather than trying to grow them to maturity. Sow a new batch of seeds every few weeks to maintain a ready supply. Greens do not need supplemental light if located in a sunny, south-facing window. Otherwise, provide 10 to 12 hours of artificial light daily. Fruiting plants are trickier to grow indoors in winter because most need ample sunlight and heat to mature. Cherry tomatoes are one of the easiest of the fruiting crops to grow indoors, though they will definitely require artificial light – about 16 hours each day. They also need nighttime temperature to be kept above 65 degrees to thrive. A warm sunroom where daytime temperatures reach 75 to 80 degrees is ideal. This tropical spice needs heat and humidity to thrive, so it isn’t the best candidate for a room that is kept at 68 degrees with the dry air of central heating. But it is feasible in a large terrarium, which can be made with any standard fish aquarium that is at least 24 inches tall (to accommodate for the height of the plants). Ginger requires good drainage, so don’t just add soil to the bottom of the aquarium; plant it in six-inch deep pots instead. You can start new plants by cutting up store-bought ginger (make sure it’s organic, as conventional ginger is often treated with growth inhibitors) into two-inch chunks with at least one knobby tip on each. Provide at least 8 hours of direct sun or 16 hours under grow lights. Sprouts are by far the easiest way to grow a little fresh food in the depths of winter. Sprouting kits are your best bet – these are basically a mason jar with a perforated lid. Soak the seeds (mung beans, alfalfa, sunflower, etc) for a day or two and then leave them to germinate in the jar, rinsing twice per day. No direct sunlight is required; ordinary room lighting or a bit of diffuse light in a window is all you need. Microgreens are essentially sprouts that have been allowed to develop their first leaves. Or you could say they are baby greens that are harvested early. Unlike sprouts, microgreens require soil – a seedling tray filled with potting soil is perfect. Soak the seeds overnight to get them started germinating and then cover them with a thin layer of soil in the tray, or just press them into the surface of the soil. Keep moist. Harvest once the first leaves emerge by cutting them with scissors just above the soil. Greens of all types are ideal for harvesting as microgreens, as are peas (that’s how you get pea shoots), and root crops, like turnips, beets, and radishes. I find this article very useful.